For this assignment I wanted to try my hand at one of the design assignments. The assignment was to make a motivational poster but with a sarcastic twist. 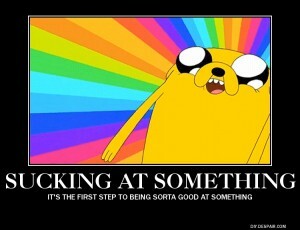 So I chose the infamous Jake the Dog from the popular cartoon network cartoon Adventure Time. He said this line once during one of the episodes and it really stuck with me because, although the rest of the cartoon is really silly and off the wall, its entertainment geared towards kids so they include morals and lessons. The assignment is posted here. Previous Previous post: When i see Math..